At long last a 40 year-old gap has been filled with the recent premier of a powerful and emotional documentary in the Belfast Film Festival called A Kind of Sisterhood. It records the stories primarily of republican women (activists in the IRA and Cumann na mBan) who were imprisoned in Armagh gaol and Maghaberry prison during the armed conflict. The hour-long documentary reveals, for the first time in this format, the harrowing experiences of the women prisoners during the epic battle between the British prime minister Maggie Thatcher and republican prisoners in Armagh women’s prison and the H-Blocks of Long Kesh during which a five-year-long prison protest ended with the deaths on hunger strike of 10 republican prisoners in 1981. The film completes the narrative cycle of that prison struggle and brings some balance to the historical record of the prison protest for political status which has almost exclusively focused on what happened to the men in the H-Blocks. The explanation for the historical imbalance has a lot to do with the gender blindness in society and its impact on the telling of the story of women political prisoners in Armagh during the prison protest. However this film places the story of the prison protest, and life in Maghaberry Prison for women political prisoners when Armagh prison closed down, into a more comprehensive setting. We get a republican female perspective on this defining period. We see for the first time what life was like for the women on protest - the heroic resistance they put up and what they viewed as the casual cruelty and inhumanity of prison warders in Armagh and Maghaberry prisons. This remarkable story has now been recorded and is there for future generations to see. So it is very fitting indeed that two Belfast feminists, with personal experiences of the prison protest in 1981 on the outside, are the architects of A Kind of Sisterhood. 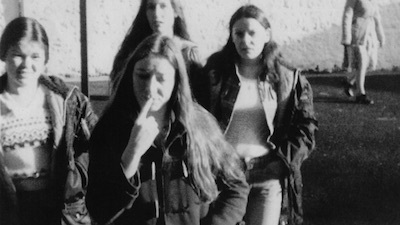 Michelle Devlin, the director of the Belfast Film Festival, as a teenager in 1981 marched in support of the protesting prisoners in Ballymacarrett/Short Strand where she grew up. She knew some the families of those on protest. Claire Hackett was a feminist activist and took part in many of the International Women’s Day protests held outside the jail and within earshot of the prisoners. The human rights campaigning priest Father Raymond Murray was for 19 years a prison chaplain to Armagh. He anchors the story of life for the prisoners as it went through various phases from the early 1970s until the prison closed in 1986. Former inmates were filmed inside the prison and their stories are all the more real, immediate and emotional as they sat inside derelict prison cells, decrepit landings, or walked about the defunct gaol recounting their experiences often as teenagers there. Liz Maskey, the first woman interned, spoke about belonging to an IRA structure, ‘A’ Company Armagh Gaol; about taking part in a failed escape bid. Brenda Murphy gave a riveting and disturbing account of the heartless decision by the prison governor to take from her, her six-week old baby girl, who was born in the prison, because she refused to end her protest for political status. Mary Doyle speaks about being on hunger strike in 1980 and about the killing of her mother by loyalists while she was in prison. Sinead Moore, who was in a cell for years with Mairead Farrell - who was shot dead by the SAS in Gibraltar - said comradeship and solidarity made it impossible for the warders to break the prisoners’ will. Jackie Upton, the only loyalist prisoner on the wing with republicans, described herself as a pawn in a game to block segregation. Rosie McCorley, who was in Maghaberry, described the horrific effects of strip-searching while Theresa McArdle speaks of the wrench from her children. “My God what have I done to my kids” is a sentiment shared by others. The last sequence of the film shows those teenage prisoners, now mothers and grandmothers, returning to the former prison on a reunion visit and writing their names on the prison walls to record their presence and connect to their past as those who view A Kind of Sisterhood will certainly do.